The LRS Guest Messaging Paging System provides the ability to notify guests with an alphanumeric message displayed on an LRS pager's digital screen. The LRS messaging paging system is used to notify guests to offer guidance on who or where they need to proceed for assistance. This system can be used in logistics centres to notify staff or freight carriers where to go to retrieve goods, churches to notify parents needed in day care, patients during hospital visits, staff and managers of retail or hospitality businesses, and other service-oriented businesses. Includes your choice of up to 60 pagers. The LRS messaging paging system may be programmed with several pre-set messages that may be easily selected on the LRS transmitter and delivered immediately to waiting customers or staff. The guest messaging paging system includes 15 LRS alpha numeric guest pagers. Each have an LCD display screen that can send text messages with up to 255 characters. An LRS Connect transmitter and charging base are also included with the pagers. This system is also compatible with LRS' free iPad wait list, table management, and paging application, On Cue. When coupled with On Cue, you'll have alternative options for managing a wait list, notifying guests by pager or SMS texts, and paging staff. 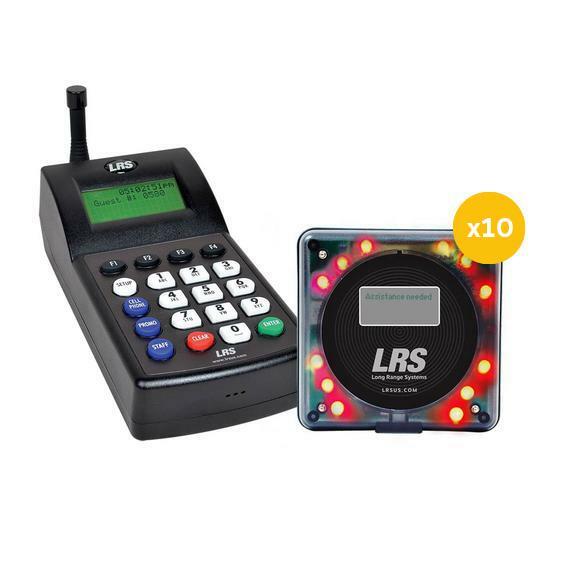 Includes: (10) LRS Alpha Numeric Pagers numbered 1-10 (RX-AC-SM), (1) LRS Connect Transmitter (TX-7470), (1) Charging Base (CH-R8-15), (2) Power Supplies. Compatible with the free LRS iPad wait list application, On Cue, offering customers the option to be notified by either SMS text messaging or an LRS pager. Perfect for: restaurants, patient paging at doctors offices and clinics, parent alerts for church child care, or other service establishments. No installation required, simple DIY set-up.